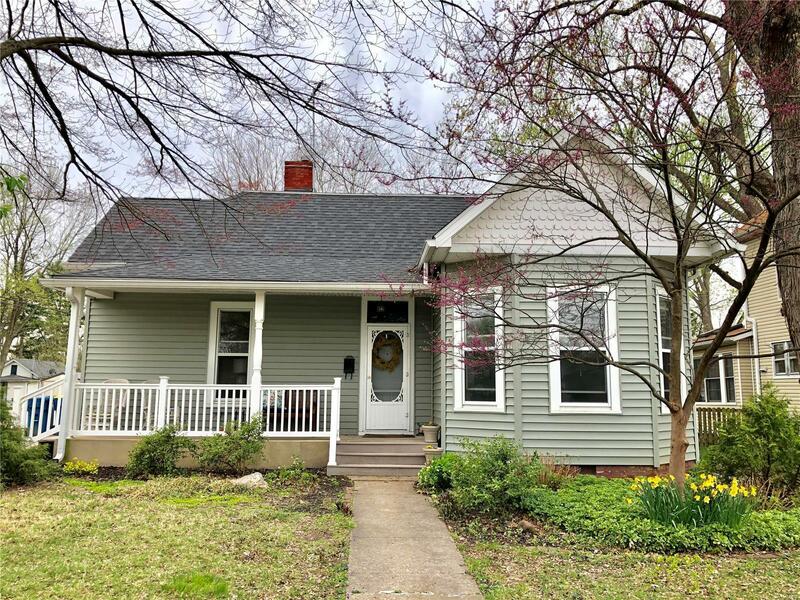 Beautifully updated and maintained 3-BR/1-BTH home in walking distance to schools, public library, downtown Main Street, and close to bike trail is move-in ready for its new owner. Roof, siding, gutters, soffits, vinyl railings, steps, and fence all new in 2013. Grand foyer, period wood work, two working pocket doors, flooded in natural light, mainly hard-wood floors, and crown molding throughout make this home relaxing and attractive. Spacious bathroom. Lots of tall cabinet space. Cheery main-floor laundry room is right off the kitchen. The enclosed mud room allows access to the back yard and to the cellar which has two rooms that could be used as workshop/hobby room or as wine cellar. Large, white-vinyl-fenced backyard with three gates beckons to enjoy the outdoors. The back ally runs behind the fence. Enjoy a glass of ice tea on the covered front porch. Tastefully landscaped on corner lot. All in all, this home has been a very special, well-loved property--and it shows!